Want to refinish your wood doors but aren’t sure how? Read these 10 tips for refinishing your doors like a pro! They can either (a) provide a very elegant and classic look to your home, or (b) they can embarrass you when friends come over by reminding them of your lack of attention to home maintenance! However, to be fair, wooden doors in southern Louisiana lead a pretty rough life. These doors have the sun beating down on them constantly, and are exposed to the wind, the rain, the brutal summer heat. And of course, there are always the hurricanes and tropical systems we get most years. Instead of replacing your favorite wood door, you can give the door a new life through refinishing. 1. Remove all of the hardware first. Before you begin removing any existing finishes or stains, first remove all of the hardware and store it safely where no pieces will be lost. This may be a good opportunity to remove rust or tarnish from the fixtures or to replace the fixtures entirely. 2. Sand away the existing varnish gradually and carefully. The experts at This Old House recommend that you sand the door in a series of stages, first using 80-grit sandpaper, then 100-grit and finally 120-grit. They explain that if you use sandpaper any finer than 120-grit, you will begin to block the pores within the wood, which will prevent the new finish from being able to adhere to the surface. 3. Work with a clean surface. Obviously, after you have been sanding away the existing finish of the door, there is going to be a lot of dust and debris. Using a combination of dry cloths and a vacuum, ensure that the surface is completely free of any obstructions that will affect the new varnish. 4. Hang the door before applying the finish. This Old House suggests that you apply the varnish to only the edges of the door before hanging it back up on its hinges. Once the door is back in place, you can add finish to the front and back surfaces. They suggest that if you apply finish to the door while it is on sawhorses, there is no way to rehang the door without causing some harm to your new finish. 5. Choosing the right finish. Better Homes and Gardens suggests using UV resistant exterior polyurethane. This is a wise suggestion, as it will give your door a durable and resistant surface that has protection from sun damage. Take your time and investigate the finishing products that you think will perform well in your climate. 6. Apply the finish to the wood, painting it on in the direction of the wood grain. Brushing the varnish onto the door in the direction of the grain will help to eliminate the appearance of brush strokes. The application will likely require two coats. Allow the first coat to dry completely, preferably overnight, before moving forward. 7. Before applying the second coat of finish, gently sand the first coat with 220-grit sandpaper. This will help you to achieve a smooth and glossy finish. This sanding should be completed very carefully and by hand. Be careful not to sand down to the bare wood. 8. Apply the second coat of finish to the wood door. The light sanding that you performed on the first coat should make it much easier for you to apply a smooth second coat. 9. Install or reinstall hardware to your newly refinished wood door. If you have chosen to purchase new hardware for your door, be careful to follow all of the manufacturer’s instructions carefully. Make certain that the hardware aligns as needed before completing the installation. 10. Enjoy your beautifully refinished wooden entry door! If handyman type work just isn’t your thing, we’ll offer a final “bonus” tip. Bonus Tip #11 – Let Doors of Elegance Re-Finish Your Doors! 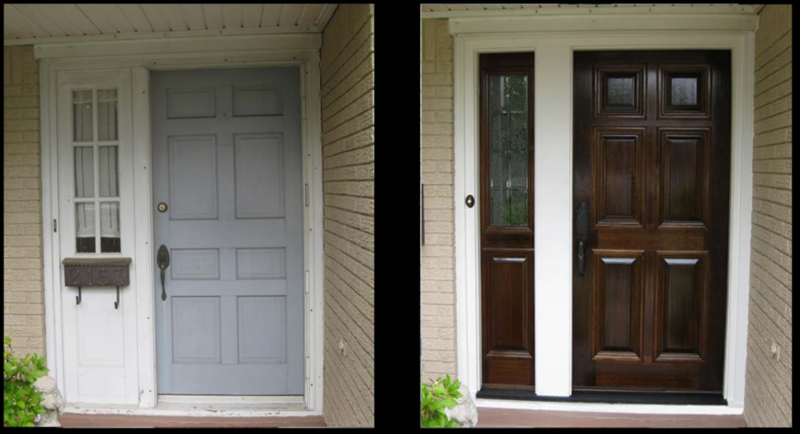 Doors of Elegance now offers door refinishing as one of our primary services. Call today for a free quote.